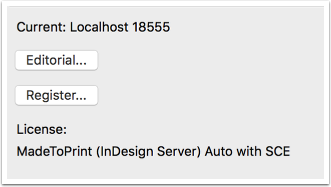 After InDesign Server has booted successfully and serving SOAP request on a specific port, you can run MadeToPrint Server UI by double-clicking the program icon. MadeToPrint Server UI is communicating with the MadeToPrint Plug-Ins via sending Adobe ExtendScripts via SOAP to the InDesign Server. 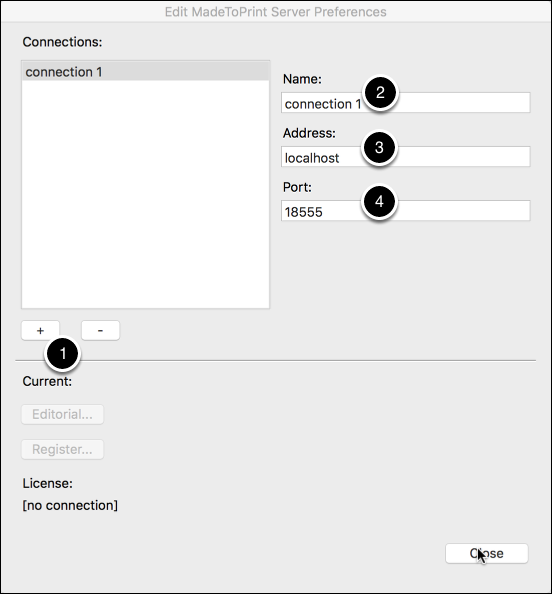 Therefore, you need to set up “Connections” (IP and Port number) in MadeToPrint Server UI. The Server UI on first startup. To add a Connection, click on the "Edit..." Button (1). In the preferences, you can now add connections. 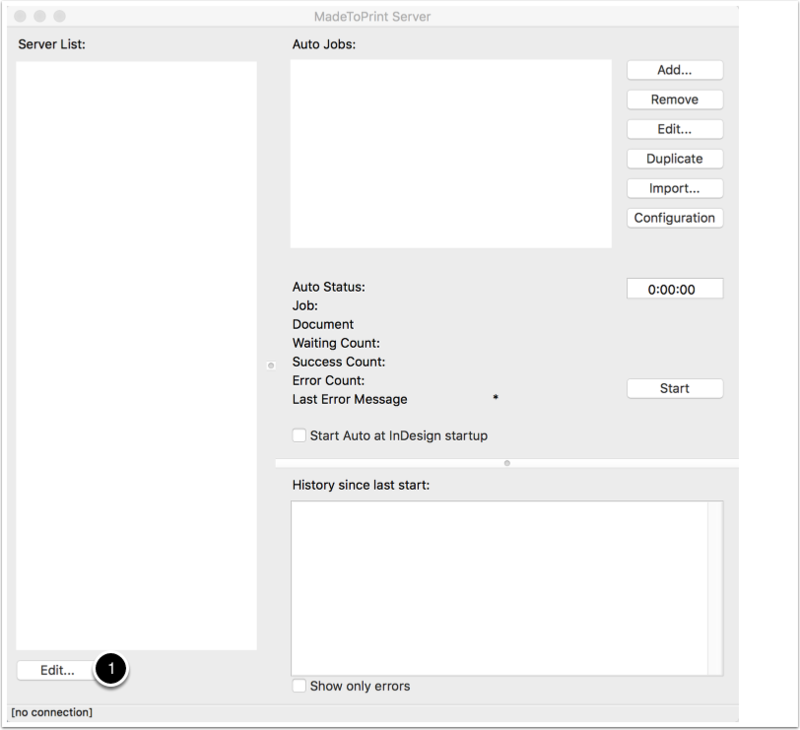 If you have multiple instances of MadeToPrint Server running, set up one connection for each of those instances. You can provide a name for the connection. This name will display in the server list in the main dialog. You need to provide an ip address or host name, where the server can be found. If it is on the same machine, it will mostly be "localhost"
You can add other instances by clicking the + button, or close the preferences. First, MadeToPrint Server must be licensed, there is no demo mode without license. On Windows, the command line must be run "As Administrator" for registration. Therefore, rightclick on CMD.exe and choose "Run as Administrator". In that command line window, start InDesign Server and use this one to register. After doing so, you can close that instance and run MadeToPrint InDesign Server the default way. 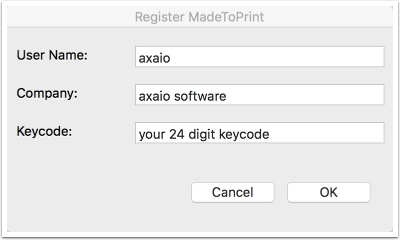 If you register one MadeToPrint Server instance, all other instances – on the same machine, on the same InDesignServer version – are registered as well. You only need to run registration for one instance. In the above "Edit MadeToPrint Server preferences" window, select a running MadeToPrint Server connection and choose "Register...". Enter your User Name, Company and the 24 alphanumeric keycode that you should have received. After hitting "OK", you may need to enter a system administrators username and password. If everything went OK, you should see a license statement at the editing window. License statement in the edit window.